I was excited to hear yesterday that soon the WoW Token would become a reality – much sooner than I had expected. And sure enough, this little feature has brought out the goblin inside of me. The idea that I can theoretically fund my subscription through ingame gold has renewed my interest in the auction house. For PROFIT! I think it’s a great addition to the game and it has some interesting consequences for us. Oh the possibilities! This has been the month of hell for me. It’s almost like clockwork that around the time I get a bit idealistic and hope for the best in people, the Universe decides to prove me wrong and does it by outdoing the level of nasty I was met with the last time. (The fact that I haven’t blogged in 2 months is usually a good sign that something is very wrong for me in the game). I was part of a guild I helped found with two others. A guild council with equal voices in decisions, and to share the burden of guild responsibility. It sounded great on paper, but I suppose the one thing we can never account for is what power can do to people. And for one of the members, having guild controls over two women who were co-leaders seemed to change everything. I have been fairly quiet this last month. Someone who just wrote about a random awesome gnome machinima somehow couldn’t find the words to discuss Warcraft when a new expansion had been announced. Not a patch, not a pet, not even a raid tier – a whole new expansion. So I decided to start at the beginning for me – which in Warcraft is heroic raiding. I am a raider and I love to raid. I don’t necessary do world or server firsts, but I still see heroic content at my own pace. It’s the main reason why I love to play. It’s also one of the biggest changes that’s happening in Warlords of Draenor. Now, if a group wants to access the hardest content available in raiding, they have to be a group of 20. Despite the reasons and logic behind this decision, I don’t think that the pros don’t justify the cons here. The biggest reasoning behind the Mythic change is raid design. It is easier to tune for a fixed raid size than have two heroic difficulties – that much has never been in question. Blizzard went a step further to to elaborate on why they thought this was the way to go. Making interesting encounters is the name of the game to keep raiders interested and to expand the kinds of encounters they can come up with, they’re taking a good long look at raid composition. It’s fairly clear that in 10-man group, we can’t always have every class represented. My own group lacks a mage for example since we happen to have two shamans. This implies that if there were a particular fight that needed the spellsteal ability, we would be screwed. The devs spent the last two expansions chanting the mantra of “bring the player not the class”, going to great lengths to ensure that groups could bring their friends without constantly having to put their class abilities first. It’s one of the biggest reasons why amidst cries of homogenisation, they went ahead with the plan and so, mages got Time Warp; hunter’s got Hysteria; druid, paladins and monks can all provide the stats buff etc. My raid group is missing a mage, but it doesn’t kill our group because the devs went through the process of making it fairly easy for a raid to cover all buffs in some form or the other. So why then, are we returning to the idea of the class rather than the player? I was around when priests used Mind Control on Razuvious on 25-man. I remember it clearly – and yet I can assure the feeling of being awesome and having a special task isn’t that great as you make it out to be. Why? Because it’s eclipsed by another issue that comes with class specificity. Let’s take the paladin example. If you have a paladin in the raid who clears the debuff correctly, all is peachy. If you have a mediocre player who isn’t paying attention and is awful about his special task, it ruins it for the entire raid. What does this lead to? Well, Bob the paladin in the raid shows up and consistently has a 50% chance of doing his job right. Recruiting isn’t ever easy, and ideally Bob would do his job. You have a friend who you know is awesome at being reactive and clearing debuffs – and you would swap the two out in a heartbeat if not for one tiny detail – your friend plays a mage, not a paladin. Alas, it cannot be. This is my memory of class specific abilities being required in fights. So-and-so is in the group because the group desperately needs an [insert class ability], and not because they have the raid awareness of a….well, very good raider. Ideally ofcourse, a team would never have to choose between the two – a player with the right class and the right raiding experience is just perfect. But in reality, raid teams are never perfect. There’s always a range of skillsets between players – recruiting is never an enviable task – and changing class requirements from being preferences of a raider leader to requirements of a particular boss just makes it all the more difficult. As a sidenote, at the end of the Mind Control thingus on Razuvious, I never once went “Wohooo! I did a super special mind control – look, priests are awesome!” I actually went “Oh thank god this is over – can I go back to healing yet?” Maybe it’s just me. My final 2 cents on the matter boils down to why I chose 10 man heroic raiding in the first place. Why did I place that on my top requirements when I was looking for a raid team? Because the closeness and tight-knit nature of 10-mans is a far far cry from 25-mans. I have always enjoyed the level of coordination and personal responsibility that 10-mans came with. Back in Wrath, when they were first introduced, it always seemed to me that 10-mans were in some sense more difficult than the 25-mans – despite the loot difference at the time. If one person died or messed up in 10-man, many times it just meant game over. The impact of a single death in 25-man was not so great. Thus 10-mans had a fairly high requirement in personal responsibility that complemented the close knit nature of working together with 9 other people. It’s an atmosphere I specifically signed up for, and for the last two expansions I didn’t have to give up seeing the hardest content for it. Lore asks an interesting question here: Make new friends or bench 5 current members? To me, this is the wrong question. The question here should be why should there be such a choice to begin with? Change is change – whether you’re recruiting new raiders or trying to find a way to tell your good-hearted but not skilled five raiders that they didn’t make the Mythic cut. We can look at this many ways but nothing about this transition seems easy or even pleasant. Why was Mythic not chosen to be a number that is already standard in the current raiding paradigm? All my ramblings come down to this: it is not in question that having a fixed size for raiding is good – it clearly is; having new mechanics in encounters is also good. Ultimately, the question we have to answer is whether getting those is worth the price they’re coming? Is it worth going back to the class specific abilities? Is it worth overhauling current raid teams for it? No, I don’t think so. I think it does more harm than good and is a step back. 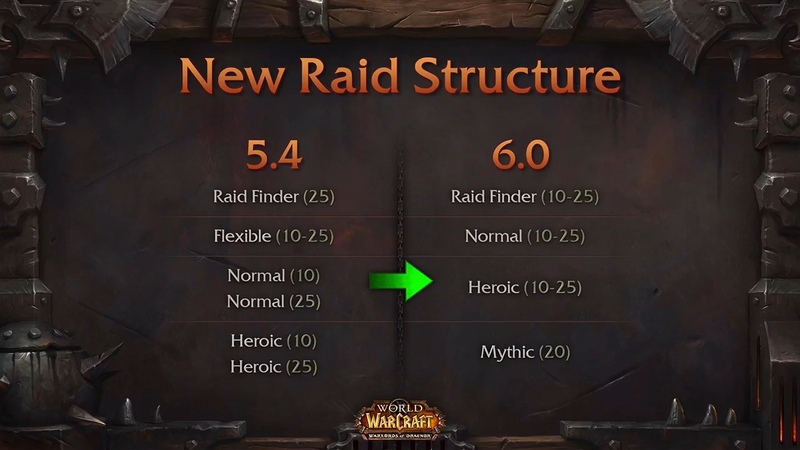 I agree that a fixed size and new mechanics would be healthier for the raiding community – at the very least there wouldn’t be this dichotomy. But this is not the path to it. The yummy heals that are yours to be! With my epic absorbs, nothing can go wrong! Taunt the boss, smack the add! Tank with us and it’ll be rad! With Pain Supp. and Spirit Shell, I’ve got your back! My raid team is recruiting a tank! More info at the guild website and recruitment thread. Disclaimer: Cute gnome is not included with the guild or raid spot. In my last post I mentioned that I’d applied to a hordeside guild and raid team. The update since then is that I did all the homework I could so it wouldn’t turn out like my experience three months ago. I listened in on a raid in mumble, asked a zillion questions and provided logs to make sure I was the healer they wanted. I liked what I heard – it had me laughing the entire time, and that’s always a good sign. Long story short, they picked me and a hop, skip, jump later there I was healing again. I was a little nervous ofcourse – the first time stepping into a real raid in the last three months and it turns that the first boss I’ll be dealing with is a heroic one! I crammed the best I could over the weekend to catch up in strats and such, hoped to high heavens that I wouldn’t blow up the raid too often. Needless to say it’s been a very fun weekend of raiding for me. The team is fantastic and I’m still grinning even when we wipe. And last night, I got something in the mail that I simply couldn’t stop grinning about! Finding a team that cares about you and invests in a player seems to be a rarity nowadays. 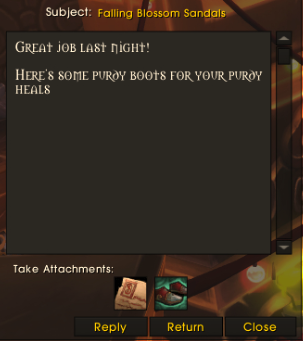 And I was overwhelmed when I was given these awesome boots to replace my raid finder ones. The last time something like this happened was during my happy raiding days in Cataclysm on my druid. Stay tuned as I catch up on my healing perspective posts!